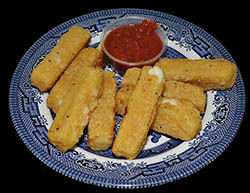 Cheese Sticks - $5.99 : South Shore Pizza & Subs Apollo Beach Ruskin Sun City Wimauma, South Shore Pizza delivers the freshest, best tasting, pizza and sub sandwiches in South Shore pizza! Warm, melty Mozzarella cheese covered in Italian bread crumbs and baked to a crispy golden brown. Perfect for dipping in marinara sauce.